Ellipsis is a new set of books celebrating the 'short story sequence' — that interlocking daisy-chain of narrative produced when stories knit together to form a continuum of character or theme. Starting in the hotels and suburbs of a down-at-heel coastal town, Jean Sprackland's stories follow a cast of rootless characters, young men and women clinging to tokens of the past, whose lives are so lacking in ballast they become as unstable as the dunes themselves. Tim Cooke invites us into a very different space: the derelict rooms and vandalised stairwells of an inner city tower-block. From there, each story draws a claustrophobic spiral round the next, following various characters (or is it the same person?) desperate to flee their demons. 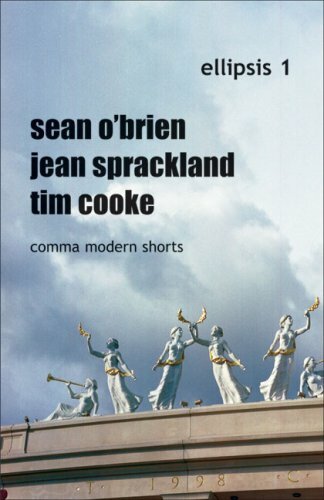 Sean O'Brien's stories also spiral outwards - not from a state of mind but a setting: an ornate, vaulted lending library, an edifice from another age, where unlikely users and chance items found in stock lead to quite different lamentations for the past. The wind’s vicious, and the boy has no gloves — his hands are icy even inside his coat pockets. Nevertheless there’s an ice-cream van parked on the sand. It must be the weekend. Surface water races glinting over the sand towards him, and he feels as though he’s inside a computer game. He aches with cold; he longs to get back indoors. He lives at the arse-end of nowhere, yet that’s his happiest moment, when he gets inside and locks the door. The wind comes straight off the sea, hyperactive on rain, sleet and hail. The place rattles all day and all night. It’s like being on a ship. He sits for hours in the window, wrapped in a sleeping bag, scanning the place with the binoculars. He studies the perimeter fence made of concrete panels, the three rows of barbed wire with bits of shredded plastic caught in it; the blackened place where they have fires and try to burn stuff that doesn’t burn properly; the cage full of wheelie-bins. There’s a few old fridges left out to rust, even though you’re meant to dispose of them carefully because of the CFCs. A stainless steel sink unit, a heap of pallets, a shattered phone box lying on its side with the payphone still inside.